The "Dear Boss" letter has always held a special fascination for Ripper enthusiasts, regardless of one's personal opinions regarding its authorship. Whether or not it was indeed penned by the Ripper, its signature is undoubtedly the origin of the killer's infamous name. 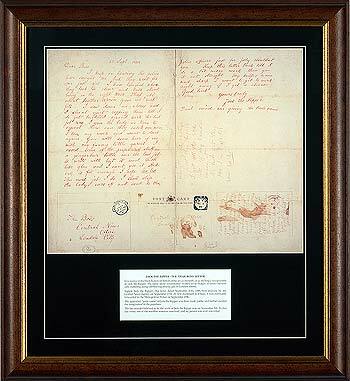 Thanks to Timeframed Limited, collectors and researchers alike can now purchase their own officially licensed and handsomely framed copy of this letter, along with the companion "Saucy Jacky" postcard. The production is top-notch, with a crystal-clear color reproduction of the "Dear Boss" letter and envelope, as well as both sides of the "Saucy Jacky" postcard. The clarity of the reproduction is so clear that one is even able to discern the individual loops and coils of the penman's "bloody" fingerprint on the front of the postcard - a humbling reminder that this letter, its author and the atrocities of which it spoke were all too real. The reproduction (printed on acid-free paper) is matted above a short description of the letters, and both are set against a black background. The frame itself is solid wood, and each production is numbered on the front. Only one thousand will be sold. Along with the frame comes a small explanatory booklet of nine pages, discussing the Dear Boss, Saucy Jacky and From Hell letters. From there the barest facts of the case are mentioned, including a long list of victims and a short rundown of some possible suspects. Some spelling and factual errors are found within the text, but overall it serves as a wonderful companion to the frame. Sitting here at my desk, viewing the frame on the wall, I almost have to consciously remind myself that I'm at home in the States and *not* in Scotland Yard's Black Museum. The letters, in all their original color and detail, are absolutely captivating, and the frame has already become the centerpiece of all things Ripperish in my collection. Although £150 seems a bit expensive for a Ripper collectible, this museum-quality prouction is well-worth the investment and is sure to become a highly sought-after item. Very highly recommended for collectors and enthusiasts. Interested parties may order the frame at http://www.timeframed.com.